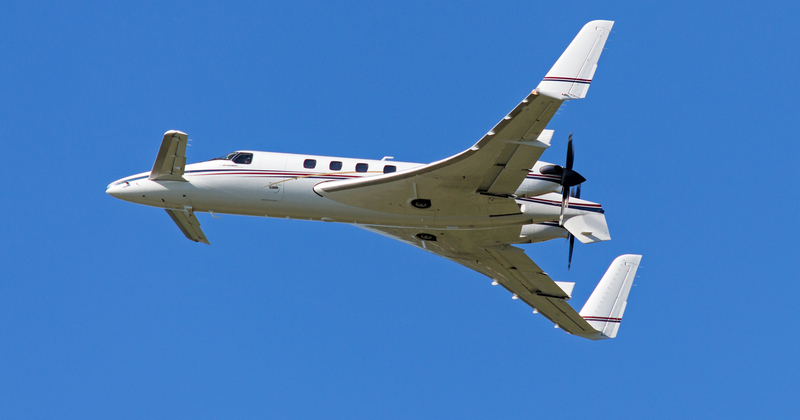 Designed in the 1980s by Burt Rutan’s company Scaled Composites and built by the Beech Aircraft Corporation, the Beechcraft Starship looks nothing like the other business transport of the day. Technological advances in the plane include its all graphite composite frame, the first civilian aircraft with such an extensive amount to be certified; a canard design with the lifting surfaces behind the horizontal stabilizer; yaw control provided by small fins on the wingtips, which eliminated the need for a rudder; and a “glass cockpit,” one of the few to be found in a civilian plane. One of only 53 built, the Museum of Flight’s plane which you can see here is on loan to the Future of Flight located at Paine Field in Everett, Washington. The Beechcraft Starship is a twin-turboprop six- to eight-passenger pressurized business aircraft produced by Beech Aircraft Corporation. The Starship is noteworthy for its carbon fiber composite airframe, canard design, lack of centrally located vertical tail, and pusher engine/propeller configuration. Carbon fiber composite was used to varying degrees on military aircraft, but at the time the Starship was certified, no civilian aircraft certified by the U.S. Federal Aviation Administration had ever used it so extensively. Beech chose carbon fiber composite for its durability and high strength-to-weight ratio. According to Beech, the Starship weighs less than it would have if it were built from aluminum. Nonetheless, the empty weight of production aircraft exceeded the target by several thousand pounds. Why Is Plane Maintenance So Important?